Peddars Way and Norfolk Coast Path: Starting near Thetford, the Peddars Way footpath (46 miles) winds its way to the coastal resort of Hunstanton, where from the impressive cliffs there are views across the Wash to Lincolnshire. Being the closest seaside resort to the Midlands the town attracts thousands of holidaymakers and day trippers, making Hunstanton a very busy town in the summer. The beach is a favourite with kite surfers. At Hunstanton, the Peddars Way joins the Norfolk Coast Path that terminates 45 miles further east at the seaside resort of Cromer. These two paths take you on a tour of the county’s most breathtaking scenery, featuring North Norfolk’s clifftops, harbour villages, salt marshes, nature reserves and extensive sandy beaches, and the lush forests, low-lying heaths and river valleys of the Norfolk Brecklands. Whether you undertake a gentle stroll along the Peddars Way Roman Road, or enjoy the entire 91-mile combined trail you’re bound to find something to interest and inspire you. The route passes by Castle Acre with its ancient castle and priory ruins. Sited on the River Nar the village is charming and has an excellent public house for refreshments. Passing along Holme beach you will pass the spot where the 4,000-year old Seahenge timber circle was discovered (timbers now at the Mary Rose Trust in Portsmouth). Other notable sites are Binham Priory and Blakeney Harbour, and there is the taste of delicious Cromer crab to look forward to upon reaching your destination. 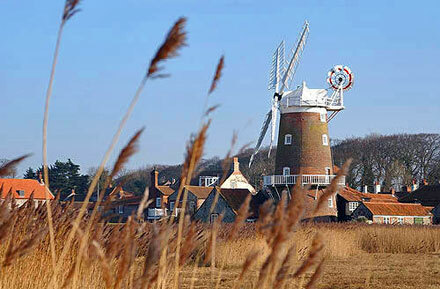 On the section between Blakeney and Salthouse you will pass the Cley Marshes Nature Reserve. The area is looked after by the Norfolk Wildlife Trust and there is an excellent visitor centre where you can pause for refreshment. From the Centre you have a panoramic view of the marshes from where you will be able to spot avocets, little egrets and marsh harriers, among numerous other species. Muckleburgh Hill: Just a few hundred feet high, this landmark is located on the coastal path just before you reach the seaside resort of Sheringham. Nearby is a fascinating war museum with static exhibits and if you wish you could try your hand at driving a Second World War tank. Called the Muckleburgh Collection, it is another great stop-off for you on this trail. The nearby village of Weybourne is quaint. It has a pretty church with the ruins of an earlier place of worship in the churchyard. Weybourne’s Ship Inn is a very good hostelry and well-behaved dogs are welcome. At Sheringham be sure to visit the North Norfolk Railway. This heritage line runs from Sheringham to the Georgian town of Holt with its stylish shops and restaurants. Weavers’ Way: Comprising woodland rambles, trails through rolling fields and farmland, routes around boggy marshland, and a mile or two (or perhaps more) alongside beautiful rivers, Weavers’ Way is a 61-mile trail that stretches between Cromer and Great Yarmouth. Walkers enjoy looking out for wildlife, visiting Cromer Pier, admiring Felbrigg Hall and Blickling Park, traversing the North Walsham and Dilham Canal, and taking photographs of the Berney Arms windmill on the River Yare, which rates as one of the Norfolk Broads’ highest mills. Originally used to grind cement clinker it was eventually converted to become a drainage pump for the surrounding marshes. It is now under the care of National Heritage. The trail is also within easy reach of a number of nature reserves and areas of local interest: ideal for spotting a variety of birds, mammals, and plants. Wherryman’s Way: Located at the heart of the Norfolk Broads, Norfolk’s own protected wetland; Wherryman’s Way is a gorgeous trail that meanders through the county’s most diverse landscape. The route takes walkers to Burgh Castle, Great Yarmouth South Quay, a number of windmills (which are a staple aspect of Norfolk’s skyline), plenty of pubs in which you and your pup can rest and refuel, and the Time and Tide museum, which resides in the traditional seaside town of Great Yarmouth. While walking your dog along these beautiful pathways will always be a pleasure, it is essential that you’re prepared for every eventuality; such routes are incredibly popular with ramblers and their pets, and you’re likely to stumble upon all manner of breeds and temperaments – and that’s just the owners! Ensure that your dog has been properly trained to walk on a lead, only let your pet roam free in suitable areas, and be prepared for a variety of doggie meet and greets. If you’re going to be exploring the great outdoors with your pet make sure its vaccinations are up to date, de-flea your dog, and always be on the look out for pests, such as ticks, certain plants that can be poisonous, and dead mammals and birds that could carry diseases. Wooded areas can be particularly tricky to navigate, so always plan your route in advance and stick to marked paths whenever possible. You should also be confident that your dog will return when called if you let it run free. Oh, and two last points – remember to take poo bags because our beautiful county must be protected for everybody who chooses to roam its many striking trails and always keep your dog on a lead near livestock. Norfolk has some of the country’s most beautiful pathways, interesting trails, and sedate scenic routes, providing hours of pleasure for walkers. The Norfolk County Council‘s website has full details of these routes and circular walks of varying lengths. The authority has ensured that the paths are well-signed so there is little risk of getting lost. Whether you’re exploring Norfolk’s byways for the very first time, or looking for somewhere new to discover after years of walking the same trails, one thing’s for sure; you’ll never get tired of the county’s landscape, regardless of how many times you’ve trodden these paths.